The objective of this paper is to demonstrate the capability of a newly developed technique for evaluation of surface-opening cracks in mass concrete. The technique is called the time-of-flight diffraction technique with impact-generated stress waves. 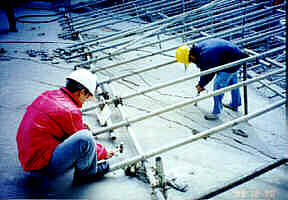 Experimental studies were carried out on laboratory mass concrete specimens containing cracks with a depth of 0.6 m. Field studies were performed on a dam located at the central region of Taiwan, which was severely damaged by an earthquake attack on Sept. 21, 1999. Experimental results demonstrate that the time-of-flight diffraction technique can be used to accurately determine the crack depth in mass concrete. A hammer with a 25-mm diameter head was used in field studies to measure a surface-opening crack having a depth of 2.31 m. These experimental results show that the time-of-flight technique has the capability to locate the bottom edge of a very deep surface-opening crack in mass concrete as impact with suitable energy is used. Currently, the width of surface cracks in a reinforced concrete structures is used as an evaluation index of structural durability in the related codes, but the crack depth, a more important factor for structural safety and durability, is rarely incorporated into the codes due to lack of effective and reliable techniques for crack depth measurement. In recent papers [1-4], an effective technique was proposed to determine the depth of surface cracks in reinforced concrete specimens. The technique is called the time-of-flight diffraction technique with impact-generated stress waves. In the technique, two receivers are used and located on the opposite sides of the crack. The first receiver located on the impact side is used to trace the time origin of impact. The second one placed on the opposite side of the crack is used to find the arrival time of the P-wave diffracted from the bottom edge of the crack. Experimental results show that the technique is capable of detecting surface-opening cracks in usual reinforced concrete members with crack depths less than 0.3 m [1-4]. Numerical and experimental results  show that the presence of steel bars results in an initial disturbance in the waveform recorded by the second receiver because P-wave can propagate across the crack along the steel bars. It is also shown that the shortest travel path for a P-wave from the impact point through the steel bars to the second receiver is obtained if the P-wave is incident upon the concrete/steel interface with a critical angle of incidence. Equations for determining the depth of steel bars are presented. Because the amplitude of the initial disturbance caused by the steel bars is small, it is still easy to identify the following arrival of the P-wave diffracted from the bottom edge of the crack. Thus, the presence of steel reinforcing bars does not have significant influences on measuring the crack depth. This paper extends the application of this technique to measuring surface-opening cracks having depths over 0.5 m. Experimental studies were carried out in the laboratory as well as in the field. Fig 1: Test scheme: (a)instrument arrangement; (b) waveform 1; (c) waveform 2. A mass concrete specimen with dimensions of 1.0×1.0×3.5m was constructed as a laboratory specimen. A 10-mm thick wood plate inserted into the mass concrete specimen was used to simulate a crack. The simulated crack has a depth of 0.6 m. The test scheme described in the preceding section was used to evaluate the depth of the cracks. Fig. 2 (a) shows a test carried out on the specimen. The stress waves were introduced into concrete by hitting the concrete surface with a steel sphere having a diameter of 15 mm. The impact point and first receiver are located on the same side. The first receiver has a distance of 0.05 m (H0) away from the impact point. The distances from the crack to the impact point and the second receiver are 0.15 m (H1) and 0.15 m (H2), respectively. Fig 2: A test c arried out on the mass concrete containing a crack: (a) test arrangement; (b) waveform 1; (c) waveform 2. The impact responses recorded at the first and second receivers are shown in Figs. 2(b) and (c), respectively. In the time-domain waveform in Fig. 2(b), a large disturbance caused by the arrival of R-wave is easy to identify and it initiates at a time of -24 ms (t1). In the waveform recorded at the second receiver as shown in Fig. 2(c), an initial disturbance caused by the arrival of P-wave diffracted from the crack tip is clearly observed and it occurs at a time of 240 ms (t2). The P- and R-wave speeds in this specimen are 4235 and 2257 m/s, respectively. Using Eq. (1) and the known R-wave speed, the shortest time (D t) for P-wave traveling from the impact point to the second receiver is calculated to be 286.2ms. Subsequently, Eq. (2) is used to determine the depth of the crack to be 0.587 m. The measurement error is about 2.2 %. In previous studies [1-4], steel spheres with diameters less than 6 mm were used as impactors. The energy of the stress waves generated by these small spheres is enough for detection of surface-opening cracks having depths less than 0.3 m. However, for cracks having depths more than 0.5 m, steel spheres with a large size are necessary to obtain better signals in experiments. Field studies were performed on a dam located at the central region of Taiwan, which was severely damaged by a 7.3-scale earthquake attack on Sept. 21, 1999. A hammer with a 25-mm diameter head was used as impactor in field studies to measure a surface-opening crack having a depth more than 2.0 m.
Fig. 3(a) shows a crack depth measurement. The 25-mm diameter hammer was hit on a metallic film having a distance of 1.0 m (H1) away from the crack being evaluated. The receiver was placed on the opposite side of the crack and was 0.8 m (H2) away from the crack. The impact responses recorded at the first and second channels of the monitoring system are shown in Figs. 3(b) and (c), respectively. The waveform in Fig. 3(b) shows that the initial contact of the hammer with the metallic film occurs at -16 ms, which is the start time of the impact (t1). In the waveform recorded at the receiver as shown in Fig. 3(c), the arrival of the P-wave diffracted from the bottom edge of the crack causes an initial disturbance and the arrival time is 1212.8 ms (t2). Using Eq. (3), the shortest time (Dt) for P-wave traveling from the impact point through the bottom edge of the crack to the receiver as illustrated in Fig. 3(a) is calculated to be 1228.8 ms. Subsequently, Eq. (2) and the known P-wave speed of 4032 m/s are used to determine the depth of the crack to be 2.31 m.
The objective of this paper is to demonstrate that the time-of-flight diffraction technique with impact-generated stress waves can be successfully applied to evaluation of surface-opening cracks in mass concrete. Laboratory and field tests were carried out on mass concrete containing surface-opening cracks. These experimental results show that the time-of-flight technique is capable of locating the bottom edge of a very deep surface-opening crack in mass concrete as impact with suitable energy is used. In this paper, a 2.31-m deep crack in a dam was successfully evaluated. The research described in this paper has been sponsored by grants from the Sinotech Engineering Consultants, Inc., Taiwan.